We found apartment 931 by chance. We made it—that wonderful little apartment—our home by choice. As Susan and I were making wedding and life-together plans in late 2007 and early 2008, a top item on the agenda was finding a place to live. I had been living in a family’s attic in Tenleytown in Northwest D.C. while Susan had been living with two roommates in Parkside, a condominium complex by the Grosvenor-Strathmore Metro station in Montgomery County, Maryland, that was nicknamed “little Provo” because of all the members of the D.C. 2nd singles ward who lived there. Clearly she wasn’t moving into an attic with me, and there was no way I was moving to the dreadfully dull Parkside, or any place outside the District of Columbia for that matter. So we started looking. We decided that a reasonable monthly rent budget would be the sum of what we had previously been paying separately—in my case, $700 a month, and for Susan, $600, for $1,300 or so. [Note 1] At the time, that actually gave us some nice things to choose from in D.C.
One of the first places we looked was at The Envoy, a beautiful, older apartment building on 16th Street NW across from Meridian Hill Park. The neighborhood itself was lovely—I had spent time there on several of my many walking explorations of the city—and Meridian Hill Park, with its dramatic fountain and paths shaded by large, old trees, was certainly a draw. The building itself was gorgeous on the outside while, inside, the lobby was stunning. Though the available apartment itself had been remodeled with carpeting and contemporary kitchen cabinets that dated the renovation to about 15 years prior, on the whole I thought it would be an awesome place to live—and we could actually afford it, too! I worked just down 16th Street, so I had arrived first on that Friday evening, 25 January 2008, and got a personal tour of the building. When Susan arrived later, she liked what we saw, too, but we weren’t quite ready to commit to the first place we’d seen. Malinda, the very friendly and very earnest leasing agent who had provided the tour, said she would hold the apartment for us even though, she whispered, she wasn’t supposed to. We thanked her and said we would be in touch. We are excited that you are interested in a new home at Waterside Towers. We have one 1 bedroom available for move in on 1-23-08 that has a fabulous water view renting for 1,300.00 to 1,400.00 per month with all utilities included. A nice feature to our apartment homes, you can enter the balcony from the living area and the bedroom. Laundry facilities are located on each floor and we use smart cards instead of coins. We are a 1/2 block from the Waterfront metro and three blocks from le’font [sic; it’s actually L’Enfant] metro. Like the apartment at The Envoy, these were carpeted, and the kitchens, too, dated to the early 1990s. But the view from the balcony was stunning, overlooking the Washington Channel and East Potomac Park, with a clear view of the Jefferson Memorial and the buildings across the river in Arlington. The top third or so of the Washington Monument was even visible above some nearby buildings. Southwest at the time was an up-and-coming neighborhood that was rapidly changing, and it could be a cool place to live, even if urban renewal in the 1960s and 1970s had stripped it of most of the historic charm that characterizes much of Washington. We said we would be in touch. A vintage advertisement for Dorchester House, published shortly before the building opened in 1941. Susan had seen an ad online for an apartment building called Dorchester House. It was at 2480 16th Street NW, just up the street from The Envoy. She suggested we stop by to see what they had, so we hopped back into Susan’s car and headed there next. Your first impression of these buildings is, of course, the lobby. While the lobby at The Envoy is visually stunning, the lobby at Dorchester House is, in its own way, impressive: it is literally the longest lobby of any apartment building in Washington. (We later learned this was because, at the time it was built, 16th Street NW was a very fashionable place to live, and the building’s front door was put at the one corner actually touching 16th Street to secure an address on that street.) That, combined with the original art-deco details still visible in the lobby, made up for the dated orange and green carpet and peach-colored walls that were slightly reminiscent of a nightclub frozen in a 1980s heyday that had long since passed. In the leasing office we met Tyrone, who whisked us up to the 9th floor to show us apartment 931, a recently vacated apartment at the end of a hallway equal in length to the building’s exaggerated lobby. We entered through the orange door and into a small foyer with a coat closet to the left. Beyond that, a vast original parquet floor shimmered like a sea thanks to what looked like an inch or two of glossy lacquer. This huge, L-shaped space served as both living and dining area. Walled off on the left was the small kitchen, with its original white washboard sink—the washboards were, in fact, the only counter space in the kitchen—and cabinetry. Across the living room were a single bedroom and bathroom, connected by a short hallway (if it could be called a hallway) and separated by a linen closet. The bathroom had a small, frosted window to the outside while the bedroom had two windows, one on each of the outside walls. The view from apartment 931. We were immediately drawn to the three windows at the far end of the living room. When we got there, we were almost awestruck by what we saw: a sweeping view of the nation’s capital, from the Washington Monument to Washington National Cathedral. We looked across much of the city, including Dupont Circle and Foggy Bottom, down to the Potomac River and beyond into Arlington. Looking down the river we could see National Airport, the Air Force Memorial near the Pentagon, and the recently completed Wilson Bridge, which carried the southern part of the Capital Beltway, Interstate 495, between Alexandria, Virginia, and Prince George’s County, Maryland. Susan and I first thought that there was no way we could afford so incredible a space. Then Tyrone told us the rent: $1,425.00 a month, all utilities included. Actually, it was entirely within our means (thanks, rent control!). Tyrone mentioned that there was another one-bedroom apartment available in the building, and he took us down to the sixth floor to see it. It, too, was a beautiful space, with a view up 16th Street toward the three church spires that crown Meridian Hill at the intersection of 16th Street, Mount Pleasant Street, and Columbia Road (a nameless square—unusual in the nation’s capital). But we knew that if we were going to live at Dorchester House, we wanted to live in apartment 931. We returned to the leasing office and told Tyrone we would be in touch. We had seen some great apartments and now we had a decision to make. We decided to take a walk through the neighborhood. We walked west down Euclid Street on the north side of Dorchester House, toward the heart of Adams Morgan at Columbia Road and 18th Street. It was a brisk, breezy, sunny day. When we arrived at the triangle bounded by Euclid Street, Champlain Street, and Columbia Road—another nameless square—we looked around. We had our Brigham Young moment: we realized that this was the place. The buildings, the shops, the trees, the rowhouses lining Euclid Street, the historic First Church of Christ, Scientist, overlooking the square—we knew this was where we wanted to begin our lives together. So we marched back to the leasing office at Dorchester House and told Tyrone we’d take apartment 931. 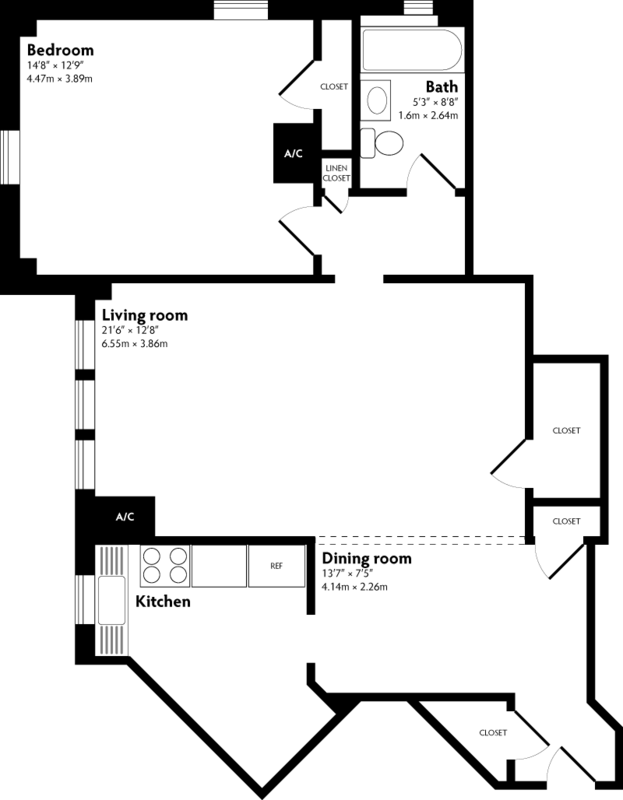 Floor plan of apartment 931. We signed the lease at 18.00 on Wednesday, 20 February, and I moved in that Saturday, 23 February. Susan joined me, of course, on Saturday, 1 March, after our wedding in New York the day before. We loved that apartment. In spite of limited kitchen and counter space, we made the best of it and that kitchen became the source of great dinners and desserts and food for parties. We loved having people over. Shortly after we moved in, the fourth Indiana Jones film was to be released. To gear up for it, over the course of a month we invited friends over and borrowed a projector to show the first three films on the large white wall in the dining area. During the first film, Raiders of the Lost Ark, we even had some special effects courtesy of Mother Nature: during the scene on a stormy night when Indiana Jones first goes into the chamber filled with snakes, a thunderstorm broke out over D.C., rushing wind through our apartment and slamming at least one door. The timing was perfect. On another occasion we had Susan’s parents, her sister Ellen, and her sister Karen and her family over for dinner. (That would pretty much be an impossible achievement in our current apartment.) There was also the time the elders quorum in our ward was supposed to feed the missionaries, but no one stepped forward to do it. So we had all eight missionaries serving in our branch as well as a few quorum members over. (Also unachievable in our current apartment.) There was the “wine and cheese” party Susan organized, and Fiona’s first birthday party. So many memories. We also loved the rooftop deck, which afforded a 360-degree panorama of the nation’s capital, including the Capitol dome and the treelined view straight down 16th Street to the White House. We had Harris Teeter, the grocery store I had grown up with in North Carolina, right next door (which also had a Redbox in the lobby), and the month we moved in D.C.’s first Target opened in the heart of Columbia Heights, a 10-minute walk away. (Our trips to Target now take around an hour one-way.) We loved walks around Meridian Hill Park and its fountain, especially after we discovered the drum circle that gathers there on Sunday afternoons. That’s not to say apartment 931 was perfect. Its south- and west-facing position on the top floor of the building—much too high for trees to shade—meant it could get terribly hot in the summer. That got a little better our second summer in the apartment when central air conditioning was installed—but that was in the midst of a protracted legal battle between the building’s owner and tenants over the installation of that air conditioning and potential reductions in rent in exchange for tenants taking over payment for their own electricity. Mice were occasional houseguests. On Thursday, 1 September 2011, our family, which by then included little Fiona, woke up in that apartment for the last time. It was virtually empty by then; our belongings were already on their way to our new home in Brooklyn. We said a bittersweet farewell to our first home. After 1,279 days —exactly three and a half years—we closed the door to apartment 931 behind us for the last time. But I will never forget the first night I spent in apartment 931. It was an exciting time, but it was also an anxious time. Susan and I felt confident in our decision to marry each other, but new experiences, no matter how great, can be nerve-racking. As I went to sleep on the air mattress we had put in the bedroom for my use that week, I lay thinking about everything ahead, with a mix of excitement and anxiety churning in my stomach. Just then, a nearly full moon broke through the clouds and a column of moonlight shone through the window right onto where I lay. A calm and peaceful feeling came over me, and I knew everything would be alright. Susan and I can’t remember if these figures are entirely accurate, but they’re close. For the record, we thought the central air conditioning was a much-needed improvement. And when people pay for their own electricity, they’re likely to use less of it—a win for everyone, including the planet. And the final ruling on the rent decrease was quite favorable to tenants, especially those, like us, who chose to start paying our own electric bill as soon as possible. It was 1,279 days from the day both Susan and Dustin lived there, 1 March 2008; since Dustin moved in on 23 February 2008, he lived in apartment 931 for 1,286 days. For more about apartment 931 and Dorchester House, including a photo gallery and an excerpt on Dorchester House and its history from the authoritative book on D.C. apartment buildings, James M. Goode’s Best Addresses, check out the new where we’ve lived section of Dialann.org. This article appeared on pages 6–9 of Issue 14 | April 2014. We're assembling information about all the places we've called home—including floor plans, photo galleries, and historical information—in this new section on our website.